This isn’t the sort of book that I can in good conscience “review.” I read it because a brief but important scene in the novel I’m writing takes place during the Marine Corps training exercise called “the Crucible,” and I needed a detailed factual account of how this exercise works in order to write the scene well. This book is not very well written, but I didn’t expect it to be, and I did get the information I needed and more – so overall this was a successful research experience. The Crucible training exercise is (in my words, not the author’s) basically a cross between a ropes course and the Stations of the Cross, except with the added component of near-starvation. This is a 2.5-day event designed to simulate the pressures of combat. In 54 hours, the recruits get only eight hours sleep and very little food, and at intervals along their hike they participate in various physical and mental challenges. Each challenge is named after a Marine who was awarded the Congressional Medal of Honor, and each event simulates the combat incident that led to that Marine’s heroism. At the beginning of each challenge, the drill instructor speaks to the recruits not only about the challenge they will be undertaking but also about the Marine the challenge is named after and about the larger context of his/her heroic acts (and yes, a couple of the Marines represented in the Crucible exercise are women). I really did learn a lot about American military history while I was reading this book. My knowledge of the Pacific Theatre in World War II has always been weak, and this book filled in a lot of the holes in my knowledge. If you have been part of an even-remotely-progressive school any time in the last thirty years, you will likely recognize the sort of challenges the Marines engage in during the Crucible exercise. In one event, a rope is strung across the trail at about the recruits’ head level, and the challenge requires the recruits to get every member of their squad over the rope without touching the rope at any time. The activity was meant to simulate a situation in which Marines had to entire a building through a broken window. While I was reading, I remembered the time my elementary school class did this same activity. We made a human pyramid of some kind, and a few strong, athletic students used the pyramid to boost themselves up and then jump over the rope. When about half of the class was on the other side, the group still on the original side boosted the lighter members of the class as best they could and the stronger students on the other side helped them over the rope. Finally, the student with the most gymnastic experience stayed on the original side until everyone else was over the rope and then backed up, got a running start, and did some kind of back handspring-thingy to get herself over the rope without touching it. The purpose of the activity is to force the group to contemplate everyone’s strengths and weaknesses and use each person to the best of his/her abilities without judgment, knowing that an individual who is not helpful on one event is likely to have the right skill set for an upcoming event. This kind of training is now common during new student orientations and leadership training at schools and colleges and during team-building events at many workplaces, though I am more than happy to concede that the Marines likely invented it first. Even the ever-popular “trust fall” makes an appearance. In general, this book was enjoyable to read while the author was covering military history and narrating the strategies the recruits used to approach each exercise. After each exercise was complete, though, the author indulged in a page or so of preachiness about teamwork and self-sacrifice and taking control of one’s destiny and the like, and I enjoyed these passages much less. I felt as if I were ten years old and sitting in a folding chair on a YMCA or Boys’ and Girls’ Club gym listening to a presentation on how the military can lift me out of poverty and give me a chance at success. I did not enjoy these passages, but I did read them and did my best to internalize them, partly for research purposes but mostly because I do think that books deserve to be taken on their own terms. I did find the stories about the Congressional Medal of Honor recipients inspiring, and I did learn what I needed to learn for my book. I do worry, though, that if my book is published I will read reviews that say things like, “This book is good and all, but I wish the author had taken the time to do some actual research on Marine training instead of just repurposing what she learned in seventh grade Outdoor Ed.” But I did do my research, and I do feel confident in moving forward with my novel, which was the point of reading this book in the first place, so I suppose I can learn to tune those voices out. 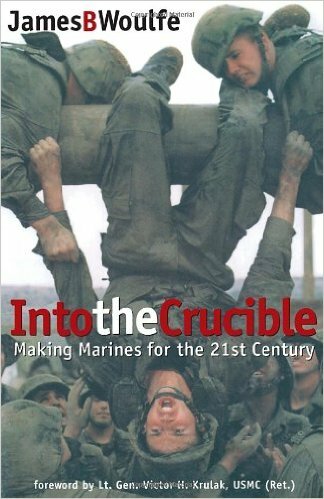 This entry was posted in James B. Woulfe, Non-fiction - History, Nonfiction - Education, Nonfiction - General, Nonfiction - Military, Reviews by Bethany and tagged Marine Corps boot camp, Marine Corps training, military training, The Crucible training exercise, USMC. Bookmark the permalink.